Upcoming Wedding Trends: Are They Right for You? While traditional weddings may never go away, fresh wedding ideas pop up every year. They are a new twist on classic traditions and allow couples to create a unique celebration that’s personalized to their style. But just like all trends, whether it’s the latest beauty product or clothing style, trendy wedding options may not be for you. Here are some of the latest trends to hit the wedding scene -- are they right for you? Within the last year, there's been a rise in the "all greenery" trend. Instead of using blooms and colorful flowers, some couples are starting to integrate only greenery into their wedding design. When done right, the look can be simple, yet elegant! However, this isn't for everyone. Before deciding if this is a good style choice for your wedding, consider the location, setting and overall theme you're hoping to achieve. If it is an idea you're in love with, talk with your wedding florist to find the right type of greenery that will match your wedding design's aesthetic! Florals have grown from solely being displayed in bouquets and centerpieces to making their way into every aspect of a wedding. Whether it’s through living botanical bars, a wall installation full of greenery, or big potted plants placed on the aisle, florals are being used in unexpected ways. If you want to use florals to make a statement at your ceremony or reception, this trend is perfect for you. Freshen up a space by creating a floral display to act as a focal point. But maybe an emphasis on florals isn’t your style, and if that’s the case then stick to florals in a traditional sense by going with a blooming bouquet or elegant centerpiece. It’s all about the experience. From alternate forms of entertainment, a destination location for an intimate wedding, or unconventional food options, couples are seeking to create an experience that their family and friends will get a kick out of. Couples choosing this route over "materials" want their guests to have a unique experience and leave with memories rather than party favors. This trend can be incorporated in a range of ways, for both modern and traditional weddings. You can either choose an unexpected space, mix up the ceremony structure, or even add a food truck to your cocktail hour. With this trend, the sky’s the limit and you can personalize your wedding with as many experience elements as you’d like, big or small. While florals always tend to add a pop of color to a ceremony or reception, weddings are seeing florals going from light pastels to deeper hues. And with Ultra Violet being Pantone’s color of the year, it’s no wonder that brides are gravitating towards darker, romantic colors. If you’re hesitant about color but curious to try this trend, add pops of color in small doses by mixing in dark-hued flowers within a lighter bunch. The dramatic colors combined with classic shades will make for a subtle statement if you don’t want to lean full-on into color. With a focus on design, weddings are seeing a transition from traditional setups to more modern, architectural spaces. While the rustic farm style had its time to shine, it’s time for museums, lofts, and rooftops to have their moment. Couples are finding themselves planning weddings at contemporary venues to mix it up and create a memorable experience for guests. If you lean more towards the traditional style with classic elements, then the modern and architectural trend may not be right for you. But if modern describes your design style then consider incorporating sleek elements into your nuptials. Lucite chairs, transparent table accessories -- mid-century modern is making its way back into the wedding scene. There are a variety of moving parts involved when bringing your wedding-day vision to life. And sometimes the pressure can feel overwhelming, especially since your wedding design should speak to who you are as a couple, your personality and your style. Although every wedding will be different, there are a few key floral details to consider including in your wedding design. Use the list below to guide you as you plan your perfect day! This is the most obvious, but also because it's the most important floral piece! Bouquets are the number one floral detail you should have for your big day. Why? Because they complete your bridal look! They are also a beautiful touch that will bring some extra pizzazz to your wedding portraits, and one of the biggest focal pieces your guests will see as you walk down the aisle. Your bouquet isn't the only thing your guests should see during the ceremony! There should be something in the ceremony area that catches your guests' eyes and says, "Stop here. This is where an important event will take place." A few examples may be greenery aisle runners, a ceremony floral installation, or a wall backdrop. And just imagine how the photos will turn out with an extra pop of greenery and/or color! First impressions aren't just for people! Set the tone as each guest walks in, and it can go a long way in completing the overall ambiance of your wedding celebrations. Consider a floral archway, or a set of large floral pots on either side of the doorway. Or for a smaller touch, add some blooms to sit atop your welcome sign! Especially if your reception will be in a different location and separate from your ceremony, you may want to consider a focal statement piece for the big celebration! Adding florals to one main wall in the reception area or hanging a floral installation from the ceiling are both two great ideas for something like this! The key is to remember quality over quantity. People will be far more likely to remember one statement piece more than they'll remember small centerpieces on each table. Especially for more formal, sit-down dinner events, giving each guest a little something at their seat or on their plate can have a meaningful impact. This can make them feel delighted and welcomed personally. You could go with a simple sprig of greenery or as elaborate as a small potted plant for each guest to take home and remember the day by! If you and your soon-to-be spouse love the outdoors and everything non-traditional, an adventure wedding may be the perfect option! Adventure weddings have increased in popularity over the last few years -- and for good reason! Not only does it give you the freedom to celebrate your love nearly anywhere you'd like, but you can likely plan it in a shorter timeframe, with less stress and with a smaller budget. To put it simply, adventure weddings are ceremonies held in an outdoorsy location, especially in places like the mountains, forest or desert. Although many couples choose to do without any wedding guests, others invite a small group of friends and family to join in on the fun! One of the best perks about this unique style of wedding is that you can put as much or as little effort into them as you'd like. You can keep the planning process to a minimum, with only the details you care most about. The first step to planning any wedding is to find the right place to say your vows. Utah's vast landscape offers dozens of great places to have an adventure wedding, which can make it hard to choose just one! Between five stunning National Parks and a wide range of state and local parks, you're sure to find something you love for an adventure wedding backdrop. You might even take a look at another one of our blog posts on 5 Outdoor Wedding Venues in Utah that may give you the inspiration you need! Keep in mind that the desert can get extremely hot during the summer and very chilly in the winter. Spring and fall are beautiful times of the year for an adventure wedding in Utah, but if you're up for some snow, winter can be just as beautiful for your big day! Once you've found your location, you should begin reaching out to a handful of wedding vendors who can help you bring your vision to life. A few you'll want to consider speaking with include a wedding photographer, a floral designer, an officiant, a wedding videographer, and a makeup and hair artist. Once you book your vendors, the rest is up to you! Send invitations to guests you'd like to join in on the fun, or start reserving a place to stay for just the two of you! The Potted Pansy, owned and operated by Mandy Ogaz, is a premier floral designer in Utah. Every arrangement, bouquet and centerpiece is custom designed to reflect your personality and love for one another. If you’re looking for a floral designer who cares about all the intricate details and is passionate about texture, color, and style (and LOVES elopements/adventure weddings! ), talk to Mandy about your wedding today! There are a lot of moving parts involved when planning your dream wedding, especially since the day is about more than just how the celebration looks -- it's about how it feels. After it is all said and done, how do you want to feel when you remember it, when you scroll through your photos or watch your video? 1. Meet with them face-to-face. Speaking with each vendor as you shop around is extremely beneficial in several ways. First, it gives you a face to a name, allowing you both to communicate more easily and get a sense of each other's personalities. You'll also feel more comfortable asking them questions over the course of the planning process, and you won't show up the day of not knowing what they look like. And even if you're planning a destination from afar, many vendors offer ways to virtually meet through programs like FaceTime, Skype, Facebook Messenger or Google Hangouts. You'll be glad you did! 2. Don't be afraid to ask questions. Write a list down in advance before speaking with each vendor, and jot down notes as you talk. And after you meet with each vendor, remember to consider how they make you feel. Are you comfortable speaking with them? Do you jive with them and feel confident in their ability to help make your wedding day unforgettable? It's also okay to meet with a few different people who offer the same services to make sure you are ready to work with the one that fits best for the role. No need to feel pressured to choose the first one you talk to, just to choose the right one. 3. Ask your vendors for referrals. Having a hard time finding other vendors after you've already booked a few on your list? Ask those you're working with who they might recommend for the other services! Some of the best wedding professionals in the industry have made solid connections with other top-notch vendors they work with regularly (or have even started close friendships!). What this means for you is that they will be personally vetted by someone else you already trust. It also can help make your day go far smoother, since they will already be able to communicate with one another before the day even begins. Take a look at their previous work. Read reviews. Compare package offerings (remember: it's not always the price you should be looking at, but what you get for what you pay). Researching your options thoroughly can give you a big head start before you even reach out to a handful of potential vendors. Try search on more than one platform: Google, Pinterest, Facebook, Instagram, and of course wedding websites like WeddingWire and The Knot. You don't need to overwhelm yourself by searching through them all, but exploring more than one will allow you to broaden your search and have the best chances of finding the perfect vendor team for your wedding. Over the last few years, ribbon has become increasingly popular in the wedding industry -- and for good reason! While other fabrics like lace and burlap have their own purposes, ribbon is the right balance of elegant and simple. It also has a sleek appearance while still being soft to the touch, which makes it a perfect chic addition to wedding dresses and decor. And who doesn't love the way ribbons float in the wind? It's simply timeless! Another popular reason why ribbon is all the rage today is the use of natural dyes. Ribbons dyed with flowers and other greenery gives it an organic look that can be hard to find in other fabrics. This also means the colors will look great with other soft and natural colors in a wedding's aesthetic, such as the dress, floral centerpieces and ceremony installation. One of the best perks of using ribbon? It works for a variety of items! From the base of the bouquets and cake layers, to a sash on a dress and the backs of the guest chairs, ribbons can bring together a wide range of wedding elements into one cohesive look everyone will love. The majority of my ribbons come from Honey Silks Co., who I also just ordered some velvet ribbon from and can't wait to use! The other two I love are froufrou Chic and Silk and Willow. Although it may not seem like it at first, centerpieces can have a big impact on your overall wedding design. Not only do they provide your guests with something beautiful to look at during the reception, but they can also be finishing touches that personalize your wedding and make it stand out from the rest! Without centerpieces, a wedding reception design can simply feel incomplete. But with a wide range of styles and looks, selecting the right one can quickly become overwhelming. Here are a few important factors to consider when finalizing your wedding design and narrowing down your centerpiece selections. If you have already planned other decor items to a specific set of colors, there's no need to reinvent the wheel when it comes to your centerpieces. Aim to keep them within the same range of colors, or choose one or two of your primary colors to ensure consistency. Then speak with your coordinator, designer, rental company and/or wedding florist to bring together a design that won't clash with the rest of your decor. Especially if your wedding is set to be outdoors, you'll want to keep the elements in mind when selecting your centerpiece items. Certain styles of candles can be blown out easily in the wind, and you might want to rely on more hardy plants for settings in full-sunlight. The setting of your reception can also provide a lot of inspiration! If you're getting married beside a mountain lodge, you may want more greenery or rustic elements involved. Or if you are celebrating your day in a garden, look for softer, more romantic pieces to go with a springtime vibe! Will your guests be seated at large round tables? Or will they be seated along wide rectangular tables? Keeping these in mind when choosing your centerpieces will be important, since one style may fit better on one table size and shape versus another. After all, that's what we're here for! We know how to listen to your ideas, understand your vision, and implement a centerpiece design that will bring your wedding reception together. Ask us for advice on florals and greenery, votives and candles, tablerunners and more! 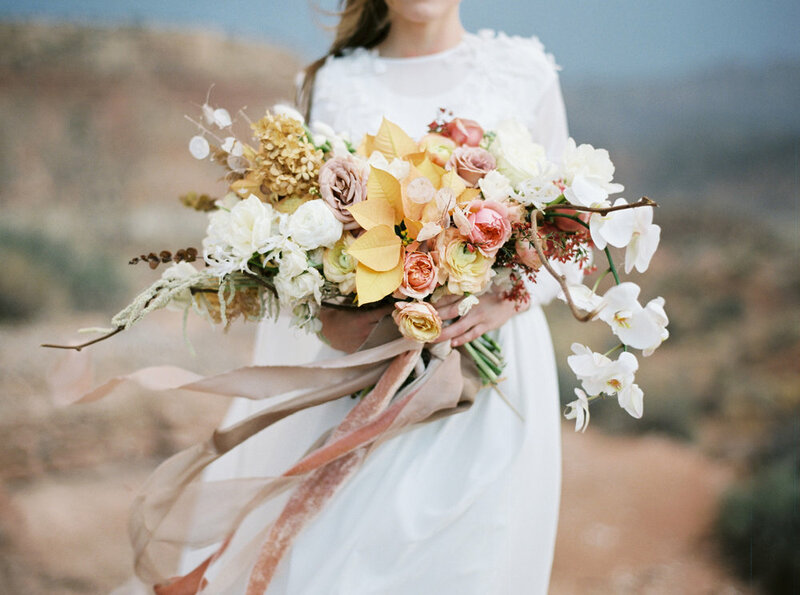 Looking for a Premier Wedding Florist in Utah? Aside from bouquets and centerpieces, florals play a major role in the overall aesthetic of a wedding. No matter if it’s an indoor wedding or outdoor wedding, rustic or elegant, floral installations and greenery are an easy way to elevate your wedding ceremony or reception. If you’re a bride that wants to make a statement at your wedding, a floral installation is the perfect way to do so. Whether it’s a wall with blossoming flowers or a table covered of greenery, here are five stunning floral installations ideas for your wedding day. Is there anything more photo-worthy than a backdrop of nothing but flowers? Draw all eyes towards you and your partner with a wall installation full of flowers or greenery as the background during your ceremony. Whether you go with natural, viney greenery or choose white roses for an elegant touch, a floral wall is sure to make a memorable statement. There’s no better place for a long, beautiful piece of garland than down the table as a runner. If you’ll be having long tables at your reception, consider adding greenery to the center as a table runner. They’re a simple way to make the table decor feel effortless and still leave plenty of space for the place settings, food and drinks. Make florals front and center by incorporating them into the biggest statement piece in the room -- the chandelier. Imagine dancing beneath a cascading arrangement of flowers and greens floating above the dance floor. Dreamy, right?! Consider working with your florist to create a floral centerpiece, like a chandelier, that can hang in the middle of the room and create a stunning focal point. Another way to incorporate greenery? By draping garlands throughout the space. Whether your venue is an outdoor tent and the garland is draped from the ceiling, or if it’s hanging against the wall in a modern indoor venue, you can’t go wrong with fresh, decorative garlands. Floating flowers create a romantic setting and are always a hit! If you’re having an outdoor wedding, you can hang floral arrangements or cascading vines from the trees, or if you’re indoors consider hanging something modern like glass globes or geometric structures with flowers woven in. The sky’s the limit! If you and the love of your life recently became engaged, then you probably already know there are a lot of moving parts to consider as you start the wedding planning process. When it comes to your wedding bouquets, centerpieces and other floral arrangements, there are certain key steps you should take to make sure everything looks cohesive and runs smoothly. Follow these steps to have all of your wedding florals ready for the big day! Before any other vendor is chosen, finding the right venue is the essential first step to planning your wedding. Why? Because it can shape how the style, setting, and timeline looks for the rest of your special day. Take this time to enjoy looking up locations you love. Do you prefer to stay local? Are you looking for a destination? Look through Pinterest and your favorite wedding magazines to find a place you absolutely adore. Once you can't imagine having it anywhere else, secure your date with the venue! After your venue has been booked, start brainstorming and researching which floral items you may want involved, including any colors or themes you want to integrate. This will give you a good initial idea of what you're looking for, which is really helpful when you begin to search for wedding florists in the area to discuss options. Bring some of your ideas to the table when you schedule your consultation with each florist. You may not need to know exactly which flowers you love or want, but showing images with your vision in mind can help your florist pinpoint the blooms, greenery and overall style that will bring your vision to life. Each time you meet or talk with a potential wedding florist, ask yourself a few key questions. How did it feel talking with them? Are they able to understand and elaborate on your wedding day vision? Other important things to consider also include whether or not they can work within the budget you have set aside for the wedding, and how much quality and value you feel you'll get with this florist. Don't be afraid to ask questions as you speak with them! You should feel extremely comfortable with your florist, even if it means talking about changes or what you do/don't like down the line. They are a key player in your big day! You might also want to head over to our blog post on the subject, How to Find the Right Floral Designer for Your Wedding! As you both work together to plan the day's decor and floral arrangements, taking a venue tour can be useful in playing with ideas before finalizing the wedding day design. Have fun walking around and seeing which areas could be great for things like your welcome table, or a jaw-dropping ceremony installation! The final step to your floral to-do list is simply the logistics: finalizing quantities of items (such as the number of centerpieces, floral crowns or bouquets), where and when the items will be delivered on the day of your wedding, and any other details that haven't been sorted out yet. Be sure to provide your florist with contact information for the other vendors (and vice versa!) so they can take care of the rest for you. And then you can relax and enjoy the day without any worries! Whether you're just starting to plan your big day or you've already begun your search for the perfect wedding vendors, be sure you're working with experienced professionals you trust to help make your dream come true. After all, this day requires a lot of hard work -- for you and for your vendors! So you'll want to select ones who understand your style, personality and vision well enough to bring it alive. And when it comes to selecting the right wedding florist, try the following steps to help guide you along the way! Having a big wedding with all the bells and whistles? Opting for a smaller, intimate ceremony? No matter the size of your wedding guest list, a pre-planned budget can keep you in line so you aren't splurging on areas of the event that may not matter to you as much, and focus more on getting the highest quality vendors for the parts you care most about (such as photography, florals and venue). Some of the most well-designed weddings don't come together overnight. They require a certain level of research, so that you know exactly what you want your day to look like and which professionals can help you achieve it! Take a look at platforms like Pinterest and Instagram to get an idea of what floral arrangement styles you love and reach out to your top floral designer choices to see if their available for your date. Do you have my wedding date available? What is your floral design process like? What can you do within my budget? Do you have experience working with my venue? What flowers might look well with my style or theme? When you've decided on the right fit after the consultations, it'll be time to put it in writing! It's standard practice for most vendors in the wedding industry to require some form of deposit to secure their services for your date, and a signed agreement that states what the work will entail. And the rest is history! You'll have a blast collaborating on floral design ideas to bring together your wedding day with an organic, natural feel. Talk with them about bouquets, centerpieces, tablerunners, installations and more! One of my all-time favorite things about living in Utah is how stunning the landscape is!! Looking for a beautiful place to get married outside? This state is a perfect option for you! From red rock to mountain scapes, Utah has so much to offer!!! And if you’re on the hunt for a few amazing outdoor venues in Utah, you’re in luck! I’ve compiled five of my favorites here for you to consider. Have you always dreamed of an elegant mountain wedding? This stunning venue at Sundance Mountain Resort is near the base of Mount Timpanogos, and offers couples the option of a 4200-square-foot grand hall or a large creekside cabin for receptions. And although summer is their peak season for weddings, they do host ceremonies during winter -- imagine saying ‘I do’ with a magical winter wonderland behind you!!! Whether you’re in love with the idea of a garden wedding, or you think it’s a perfect setting for a spring or summer ceremony, take a look at Red Butte Gardens! This venue has over 100 acres to explore, hundreds of various backdrops for beautiful wedding photos, and great views of both the mountains and cityscapes! Another fantastic mountain venue I can’t get enough of is the Deer Valley Resort! From the gorgeous views outside to the luxurious lodges that offer tons of space for big weddings, there’s a lot to love about this location! For something truly breathtaking, I think Alta Peruvian Lodge is an amazing option! Just wait until you see the mountains and forests surrounding what could be your ceremony location! Mountain peaks, rocky cliffs, forests and wildflowers -- there’s nothing quite like it! With lots of exposed red rock and beautiful trickling streams, Louland Falls is a simple yet scenic place for your big day, right among the Parley’s Canyon mountains. It’s also a private and gated venue, so you won’t have to worry about anyone else crashing the party. Planning an Outdoor Wedding in Utah? Reach out to The Potted Pansy! There are so many moving parts involved when planning a wedding. So it's totally understandable that many couples rush through some steps in the process! However, it's important to make decisions carefully, so that they don't become mistakes you regret down the road. If you're currently in the process of selecting your wedding floral arrangements and decor, here are some mistakes to avoid at all costs -- and you're wedding florist will thank you for! Choosing your wedding day floral designer shouldn't be a decision made lightly. Be sure to do your research! Remember to find someone that you feel comfortable with, who sees your vision and enhances it, and who makes the process seem simple and fun! Remember: this is your day. If you ever feel that knotted feeling in your stomach about a decision you already made, do your best to change it while you can! There are some flowers that may sound pretty for a bouquet or centerpiece in theory, but in reality can affect your wedding day in a negative way. Ask your florist for their recommendations on flowers that hold up well in bouquets, especially for outdoor weddings. And try to limit how many strong-scented flowers you place at each dinner table -- they may overpower the room and affect your guests' appetites! Flowers are seasonal, and this is an important factor to remember! If you're having a spring wedding, but are hoping for flowers that bloom in fall, you will likely have a harder time obtaining the flowers you want. And even if they are available, chances are that they will be much more expensive than you'd like. Many of the best wedding florists can assist you with selecting flower colors that would work well with your theme, setting and dress colors. Try to be open minded about the process! And strive for bridesmaid bouquets that aren't too monochromatic with their dresses -- you want the bouquets to stand out from their dresses, not blend in! If you're anything like me, then you probably LOVE flowers -- especially when it comes to wedding decorations and accessories! Although most people typically think of wedding day flowers in relation to the bouquets, boutonnieres and centerpieces, there are many more ways to add a bit of nature into your wedding theme and designs!! Ceremony installations and backdrops that involve a lot of greenery and florals are one of my all-time favorite things on this planet! I believe it truly gives an extra bit of romance to a moment that will mean so much to the both of you -- so why not make it even more special by standing in front of something beautiful?! Whether you're looking for a beautiful arch covered in garland and roses, a large greenery backdrop, or some other unique idea, including a ceremony installation is a gorgeous way to elevate your vow ceremony. I love love LOVE that flower crowns and floral hairstyles are back "in" again! No matter where you're getting married or what your wedding day style is, there is certainly a floral hairstyle to match. Prefer a simple look? Find one bloom that grabs everyone's attention! Going for a boho vibe? Nothing fits that better than a flower or greenery crown! You might even consider having your bridesmaids involved, each with a slightly different look! Is there a grand entrance to the building at your venue? Or stairways at a particular spot that will be involved in one of the wedding-day festivities? Think about adding a bit of color to make it your own! Garlands are beautiful for this option, but so are other types of greenery, especially if you blend in some of your color palette or similar flowers to the ones in your bouquet. Get glamorous and creative with floral chandeliers and dangling installations above the dance floor or reception tables! You can make it as over the top or as simple as you'd like, and it's definitely one that your guests will be talking about for days to come. If your wedding venue has one or more fountains onsite, you might want to ask the venue's coordinator if they allow flowers in the fountain! You could create an overflowing bouquet-like piece to really give it some personality, or you could use small flowers that float on the water's surfaces -- a truly romantic and dreamy option! Not a fan of roses? Hoping to stay away from traditional flowers or colors for your wedding flower arrangements? No problem! Whether you're hoping to achieve that off-beat bride look, or you simply don't want traditional wedding flowers, there are a few key ways to have non-traditional wedding florals for your big day. Take a look at the following tips to help you create an outside-of-the-box bouquet or centerpieces unlike any other! One of the first few steps you can take to have unique flower arrangements is by starting with your wedding color scheme. If a traditional look isn't for you, go for bolder or deeper colors on the color wheel. You might also consider changing out the soft pinks and solid reds with similar colors that might be a little lighter or darker than what you might be used to! There's nothing quite like a bouquet that challenges the norm with plants that have fun textures to them! Some options include greenery, branches and foliage, berries, or even seeds. Ask your florist to see what plants might best achieve the look you're going for! While it is becoming far more popular than it used to, mixing up the florals you include instead of choosing all one flower is a great way to stand out from the crowd of other brides. It can be really stunning to have a unique combination of florals in your bouquet, especially if you have one big flower to be the focal piece! Are you wanting to have a bouquet that’s unlike any you’ve seen before? Make a statement with a non-traditional floral design that speaks to your personality and style! The Potted Pansy, owned and operated by Mandy Ogaz, is a premier floral designer in Utah. Every arrangement, bouquet and centerpiece is custom designed to reflect your personality and love for one another. If you’re looking for a floral designer who cares about all the intricate details and is passionate about texture, color, and style, talk to Mandy about your wedding today! One of my all-time favorite settings for elopements is a national park! And luckily here in Utah we have five of them (Zion, Arches, Canyonlands, Capitol Reef and Bryce)! If you're planning to elope in a national park, Utah is one of the best places to do so. Learn some tips and information below to create the perfect destination elopement at one of our gorgeous national parks! It's fairly standard for most public places to require permits, and the National Park System is no exception. While you can get married in a national park, you'll likely need to pay for a permit to do so -- even if it's just the two of you plus your officiant. Most of these permits are under $200, and should be reserved as soon as you can (even if that's several months in advance!). Each park may have its own rules, so be sure to ask someone from the park you plan to elope to for more information about their requirements. Depending on the time of year you want to get married, you may have to check with the National Park Service to learn which months may have roads and trails closed off for the winter months. Many of the parks close sections (or the park entirely) on days when snowstorms blow through, so be sure to do your research. Some parks may have specific areas designated for elopement and wedding ceremonies. Check with your park to see if you can get married at a location of your choosing or if they require you to select one from their recommended locations. Be sure to talk with any wedding vendors (such as wedding florists or photographers) about your specific plans well in advance. This will help them to know where to meet you inside the park, and be prepared in case you are hiking to a specific spot for the ceremony. If you run into problems with weather or some other problem arises, consider selecting a backup location. Thankfully, Utah has several national monuments, state parks, and recreational areas with just as gorgeous views of our state as the national parks do! The Potted Pansy, owned and operated by Mandy Ogaz, is a premier floral designer in Utah. Every arrangement, bouquet and centerpiece is custom designed to reflect your personality and love for one another. If you’re looking for a floral designer who cares about all the intricate details and is passionate about texture, color, and style (and LOVES elopements! ), talk to Mandy about your wedding today! Fall is my absolute most favorite season of them all for so many reasons! Not only are the colors just jaw-dropingly gorgeous, but its colors are just so warm and inviting, especially for wedding bouquets!! Fall weddings are all about embracing the season and the nature changing around you! In Utah, the mountains start to change color in early September and gradually the colors fill the valley through October -- making this time of year just perfect for saying your vows and celebrating love! What flower colors are best for each season? 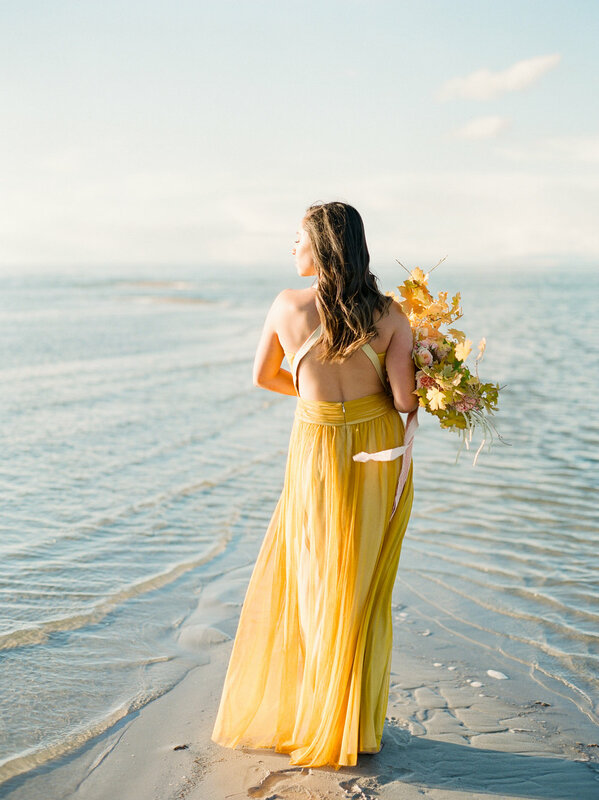 If you're getting married in Utah around this time of year, it's fun to select colors that tie your wedding to the natural world around you, and only enhances and amplifies the decor you choose! One of the most commonly asked questions I hear is what coloring is best for each season. I like to respond by saying that nature tells us what is best already! Each season, nature gives us flowers and foliage that are truly distinctive and indicate what colors are best to use for wedding bouquets, decorations and backdrops. What flowers work well with fall weddings? Whether you and the love of your life are two adventurous souls, or you both are simply looking for a gorgeous location to elope, Utah has a variety of beautiful landscapes to choose from! From valleys and canyons, to red rocks and mountain cliffs, you'll find there are few destinations in the world quite like this one. What better place to say your vows than among sweeping views, blue skies and endless opportunities to explore?! Take a look at these ideas for a truly scenic (and unforgettable!) elopement in Utah! You won't have to drive too far from Salt Lake City for this one -- and yet it's one of the most unique environments in the world! The Bonneville Salt Flats is a desert playa, which is a very flat piece of desert that is filled with salt. You may visit one day when it's nothing but a big expansive flat rock, and other days you may see it as a beautiful, thin lake with stunning reflections. But you'll have to aim for winter or spring months if the mirror-like effects are what you're hoping for in your elopement photos. This one is a very popular choice, but only because it's worth it! Zion National Park is known as Utah's first national park and can give you and your soon-to-be spouse an unforgettable elopement. Two iconic locations include the cliffs of Angels Landing (which will require a pretty steep hike!) and the Narrows (a magical area of the canyon where a creek runs through tall walls of rock!). Looking for that red/orange sandstone ambiance to your elopement? There's no better place than the arches, rocks and towers in Arches National Park, located just outside of Moab, Utah. You'll also get beautiful panoramic views everywhere you go! A perfect option for adventurous couples! Want a little extra water with your desert? Dip your toes into the blue waters of Lake Powell while still obtaining a desert theme to your Utah elopement! You might even consider staying overnight at one of the campsites or wandering near the ancient petroglyphs nearby. For a more mountainous elopement ceremony, head on over to Eagle Point! You can say your vows at an elevation of around 10,000 feet and explore the aspen and pine forests nearby afterwards for some truly stunning photographs with your new life partner. Eloping to Utah? Reach out to The Potted Pansy! Are you planning your wedding and starting to think about your bouquet? Or are you simply curious about how the floral wedding traditions started? Learn about the history behind the wedding flower decorations, bouquets and more below! Turns out, it hasn’t always been because it looks pretty. Oddly enough, brides began carrying bouquets to “mask” her scent. Back in the 15th century, showers and soaps weren’t as common as they are now -- which meant women often didn’t smell very clean or appealling. Additionally, traditional folklore suggested that flowers and other spices could warn off evil spirits with their strong scents. It’s likely that this started to change during the Victorian age, when flowers were beginning to be used as a nice gesture to those we love. This was also the time period when the “meaning” of flowers (otherwise known as the language of flowers) was created. Flowers have almost always had a presence in a variety of ceremonial traditions, so it should be no surprise that nearly every culture involves flowers and greenery in their wedding celebrations! For instance, ancient Greek brides often carried ivy as a way to symbolize endless love for their soon-to-be spouse, and in Indian traditions, both the bride and groom wore floral headpieces during the ceremony. If you’re interested in incorporating some of your own family history into your wedding day, take a look at this list of unique wedding flower traditions from a variety of cultures to inspire you! When it comes to selecting flowers and greenery for your wedding, one of the most important steps is choosing which ones you’ll want for your bouquet. Not only will it be one of the most photographed items on your big day, but the bouquet is also a major focal piece that can say a lot about the style you’re going for! But with hundreds of inspiration ideas on Pinterest, choosing florals for your bouquet can very quickly become an overwhelming task. Take a look at these tips to help you decide on the most perfect florals for your bridal bouquet! Are you going for that soft, vintage look? What is your ceremony location like? Which types of florals or greenery might match your wedding dress? These are all important factors to consider when planning your bouquet. The style, location, theme, setting and color palette should have an impact on your decision. Take the time to explore out-of-the-box ideas and save the ones that speak to you the most. Don’t rush into choosing the first one you fall in love with. It’s also helpful to research various types of plants that may match the colors you want to go for. But don't worry, it's our job to help you know what the names of those plants are and how to use them! If you simply have images, that is enough! Remember, you may be surprised to find something you’ve never heard of! If you have a budget you are trying to stay within, explore various options you love that have a similar vibe or color palette. Your florist will be able to help you narrow down costs and expenses of each of these options. Sometimes you can achieve a look that is just as stunning with flowers or greenery that are less expensive than your top choice! When in doubt, ask away! Whether you aren’t sure about how to achieve a certain style or you want to ask for expertise and guidance, speaking with a floral designer is the best stress-free way to plan your bouquet! Getting married in Utah? Reach out to The Potted Pansy!